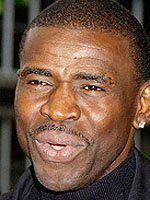 JANUARY 14--When a fellow Dallas motorist pointed a handgun at Michael Irvin Monday evening, the NFL Hall of Famer thought he was about to be robbed. But when the motorist and an accomplice recognized the 42-year-old former Dallas Cowboys star, the weapon was lowered and one of the suspects called out Irvin's name in recognition, according to a Dallas Police Department report. Irvin's close call occurred at about 9:30 PM Monday when the ex-athlete stopped at a red light. That's when a second car pulled up next to Irvin's vehicle and the driver rolled down his window. Irvin, 'thinking the suspects wanted to talk,' rolled down his window. At that point, Irvin told cops, he 'observed suspect two raise his hand and point and unknown type semi auto pistol' at him. However, before anything else transpired, one of the suspects recognized the duo's apparent prey as 'The Playmaker,' the 2007 Hall of Fame inductee who was named to five Pro Bowl squads and was a member of three Super Bowl-winning Dallas teams. Strangely, though the incident reportedly happened Monday evening, Irvin did not contact cops until 5:51 PM Tuesday afternoon, according to Corporal Kevin Janse, a Dallas Police spokesman. Janse told TSG that Irvin 'flagged down' a cop, but he did not know where that occurred. Additionally, though Irvin told reporters today that he carried on a conversation with the suspects for several minutes (topics included the Cowboys and the NFL playoffs) before the would-be assailants sped off, the police report does not reflect that banter.